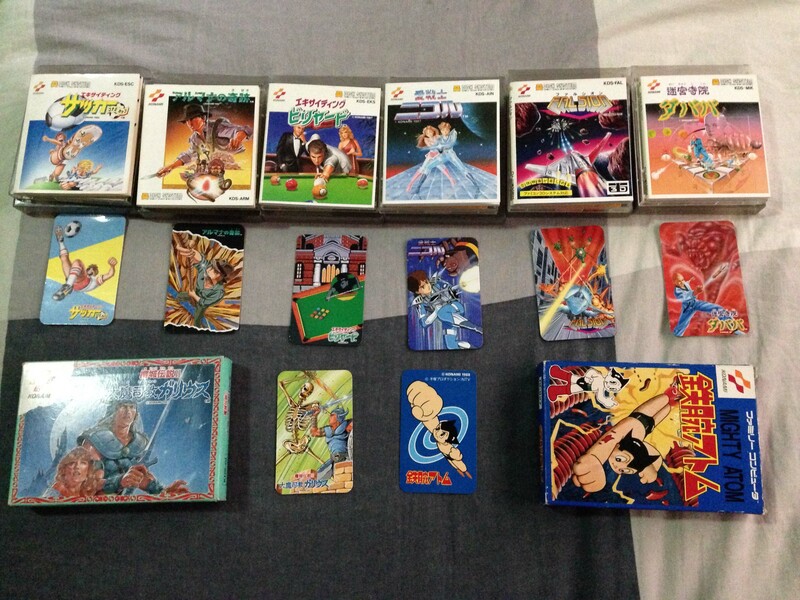 8/20 Konami Famicom Collector Cards – Nintendo Sega Japan! At some point starting in 1987, Konami decided to include a collector card with all their titles. Each card had an illustration related to the game. Some cards had screenshots or pieces of screenshots, others had artwork of scenes in the game. I have the bolded ones already, and I always like the idea of complete sets of something (when the goal is achievable) so I’m on a mini-collection quest to get one card of each game that had one. Of the ones I have, I like Arumana no Kiseki and Astro Boy best. So now I have 12 to go. Some will be easy to get (there are plenty of cheap copies of Konami Baseball and Basketball), some will be harder (popular titles like Salamander and Metal Gear). Do Re Mikka will likely be hardest, it’s a very expensive music game that came with a piano keyboard controller. Pingback: Arumana no Kiseki (Miracle of Armana) – Famicom Disk System – Nintendo Sega Japan! Pingback: Famicom Contra (コントラ Kontora) – Nintendo Sega Japan! Pingback: Contra (コントラ Kontora) – Famicom – Nintendo Sega Japan! Pingback: DoReMikko (ドレミッコ) – Famicom Disk System – Nintendo Sega Japan!